The entire contents of the website, including but not limited to text, publications, newsletters, articles, opinions, minutes of meetings, notice of meetings, views, graphics, images, HTML code and other codes, and the selection and arrangement of information (“Materials”), are protected by copyright and other intellectual property laws under both the laws of Canada and of foreign countries. 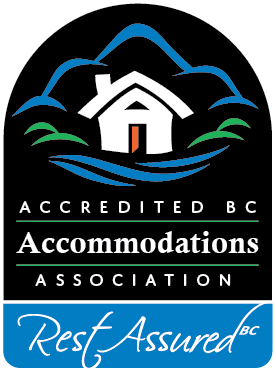 The Accredited BC Accommodations logo, certain other logos, and all related words, domain names and logos are trade-marks and the property of Accredited BC Accommodations. All other trade-marks, product names and company and member names or logos cited herein are the property of their respective owners. Accredited BC Accommodations’ name and logo may not be used without Accredited BC Accommodations’ express authorization and, without limiting the generality of the foregoing, Accredited BC Accommodations trade-marks or logos may not be used in connection with any products or services that are not those of Accredited BC Accommodations or authorized by Accredited BC Accommodations, in any manner that is likely to cause confusion among parties dealing with Accredited BC Accommodations, or in any manner that disparages or discredits Accredited BC Accommodations. The materials contained on (domain name) including all portions of the Website, content, site design, text, graphics, and the selection and arrangement thereof are (copyright date) and Accredited BC Accommodations Association or its licensors, as applicable. ALL RIGHTS ARE RESERVED. You are granted a limited license to display or print the Materials for personal use, provided the Materials are not modified. You are further granted a limited license to use the e-mail and internet links (the “Services”) provided on the Website. Any other use of the Materials or Services is prohibited. All rights not expressly granted herein are reserved. None of the Materials or Services may be otherwise re-produced, re-published, re-disseminated or otherwise provided in any manner or form without the prior written consent of Accredited BC Accommodations. The use of the Materials or Services on any other website is prohibited. If you violate any of these Terms and Conditions, your permission to use the Materials and Services will automatically terminate. Without the use of encryption, the internet is not a secured medium and privacy cannot be ensured. Accredited BC Accommodations will not be responsible for any damages you or any third party may suffer as a result of the transmission of confidential information that you make to any third party through the e-mail links on this Website. Accredited BC Accommodations is not responsible for any errors or changes made to any transmitted information. Any Information you may choose to transmit is done so at your own risk. The Materials and Services are provided for educational or informational purposes only. Any statement, service, opinion, advice, article, publication, offer, or other information or content expressed or made available on this Website is that of the respective author and not of Accredited BC Accommodations. The Materials and Services contained in this Website are provided on an “as is, where is, as available” basis without any representations, warranties or conditions of any kind with respect to the Website, Materials or Services. Accredited BC Accommodations disclaims all warranties. You hereby irrevocably waive any claim against Accredited BC Accommodations with respect to such other web sites as may be linked to this Website. In no event shall Accredited BC Accommodations, its officers, affiliates, agents, employees or internet service providers (together, its “Representatives”) be liable to you or any third party for any damages, claims, expenses or other costs arising out of or in connection with the use of this Website, the Materials, Services, or any other hyperlinked web site. This Website is controlled by Accredited BC Accommodations from its offices within the Province of British Columbia, Canada. As each of the places in the world that have access to this Website have laws that may differ from those of the Province of British Columbia, you agree that all matters relating to access to, or use of, this Website, the Material, the Services, or any other hyperlinked website, shall be governed by the laws of the Province of British Columbia and the laws of Canada. You also agree and hereby submit to the exclusive personal jurisdiction and venue of the courts of the Province of British Columbia and acknowledge that you do so voluntarily and are responsible for complying with local laws.